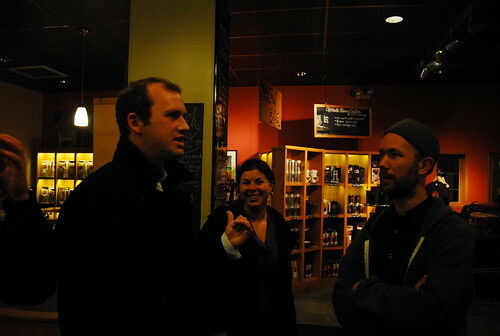 Dan Baumfeld of Neptune Coffee, one of the many excellent, industry-leading coffee professionals we had at the Seattle Coffee Society meeting last week, has some nice pictures up of the get-together. Check out the whole set here. 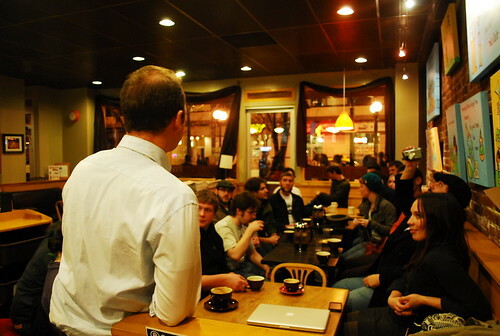 The Seattle Coffee Society will convene its first meeting Thursday, December 9th, at 6:30 pm. Our venue is the lovely Seattle Coffee Works downtown on Pike between 1st and 2nd. A perfect, super-Seattley, super-coffee-oriented location for our first every get-together. What could be more appropriate? We will brew coffee, look at some video from origin, and have a discussion on how different coffee origins distinguish themselves in the specialty coffee market. Also, what can we expect to see from different origins in the next few years? It will be fun and relaxed, but pitched at a high knowledge-level. If that sounds like your cup of caturra, send me an email at seattlecoffeesociety@gmail.com You can also email me if you want to be on our mailing list. If you wonder what the heck I am talking about, my original post about the Seattle Coffee Society is here. Even if you can't make it next Thursday, please help spread the word about this! Again: Dec 9. 6:30 pm. Seattle Coffee Works. 107 Pike Street. Be there! I'll be hosting a cupping at Cellar Door Coffee Roasters in Southeast Portland this Thursday, May 13th. On the table: fresh crop Ethiopian coffees, from all sides of the specialty industry in that country. Private exporters, farm owners, and smallholder farmer cooperatives. We'll do two flights of top grade coffees, and I'll be giving a short presentation on the state of the coffee industry in Ethiopia. Thursday, May 13th, 2 pm. Cellar Door Coffee: 2001 Southeast 11th Avenue. Portland, OR. This cupping is primarily aimed at roasters and importers. Please send me an email at danielh@bootcoffee.com if you are interested in coming. I have a few spots I am trying to fill for my next project in Ethiopia. These spots are generally reserved for serious coffee buyers — roasters, importers, or others in a position to purchase green coffee. However, I'm willing to listen to all serious proposals from coffee professionals. There are two programs, the 2010 Ethiopia Coffee Roundtable in Addis Ababa in February, which is less demanding; and the first ever Cupping Caravan program in Sidama/Yirgacheffe and Harar, in February and March respectively, which is involves travel by 4x4 out to the coffee lands to cup with farmers. Here is the information about the two programs. Please direct serious inquiries only to danielh@bootcoffee.com. Please feel free to forward this information to anyone you think would be qualified/interested. Boot Coffee and the United States Agency for International Development invite you to the fourth annual Ethiopian Coffee Roundtable, February 18 - 20, in Addis Ababa. As you are probably aware, there have been some very big changes in the Ethiopian coffee industry over the last 18 months. The Roundtable is an opportunity for coffee professionals from around the world to gather, take stock of the situation on the ground, and give input that will help determine the direction of Ethiopian coffee in the future. This program is fully funded by a grant from the United States Agency for International Development's Agriculture and Trade Expansion Program (USAID - ATEP). All in-country expenses for those attending are paid. That means hotel, ground transportation, and meals. This is a perfect situation for people who have other business to do in Africa, or who plan on going to Mombasa, Kenya, for the EAFCA Conference and Exhibition, which is February 11- 13. We've had a very positive response from the Ethiopian Coffee Roundtable in past years. Professionals from different sectors of the Ethiopian coffee industry (private exporters, millers, agronomists, government officials, etc) will be giving presentations in their area of expertise. There will also be presentations and question-and-answer periods with coffee experts from around the world. And plenty of opportunities to interact one-on-one. The Cupping Caravan is a one-of-a-kind coffee origin trip that we are very excited about. A select group of just 12 buyers from around the world will be traveling in small groups by 4x4 vehicle out into the coffee lands of Ethiopia to cup with the actual producers, at their mills, coopratives, and farms. This is a fantastic opportunity for buyers to get away from the export mills and into the places that are rarely seen in Ethiopia. We also intend it to be a game-changing experience for the farmers who participate, as they rarely get a chance to interact directly with the people who ultimately buy their coffee. There are two Caravan itineraries, one in the Sidama/Yirgacheffe area from February 22-26; and one in the rugged Harar region, from March 14-20. Both are timed to coincide with the local harvest, and both will include a day of cupping with exporters in the cities in addition to days of visiting the coffee lands. All in-country costs, including transportation, hotel, and meals, are covered by USAID-ATEP and Boot Coffee. All we request from you is your presence and expertise! We'd be honored if you could attend some or all of these activities. Please let me know if you have any questions, and what your thoughts are. I hope you had a great 2009 and that 2010 is even better. While I am in Seattle, I thought it would be fun to explore some new coffee shops and blog about it here. I'll still be hitting up my old favorites, but I've mentioned them on here before. Instead I'm going to mention places that are new, new to me, or just really interesting. 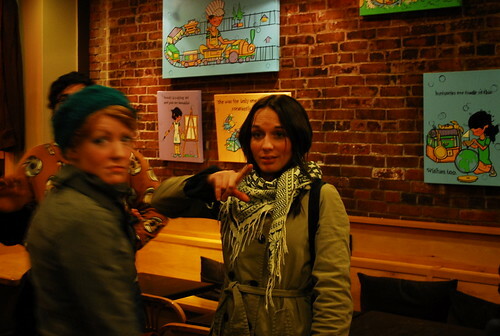 Tuesday, for instance, I was at Victrola on 15th, which is my old tamping grounds. That beautiful old Synesso is still in there (first one ever in a coffee shop... I remember the day they installed it... serial number #0002). I had a lovely cappuccino and ran into some old friends. In fact, I saw fellow erstwhile Brooklynite Liz Clayton fresh on her return from the Nordic Barista Cup in Iceland. She's in town for Coffee Fest, which is this weekend. Also happening this weekend, FYI, is a Seattle VS Los Angeles latte art competition being held by Victrola at their Pike Street location. 10 Seattle baristas against 10 LA baristas, with booze and music to follow. Apparently it's predicted to be a rager and they are planning for hundreds of people to be there.. But! It being a positively glorious late-summer Seattle day (78 degrees, no humidity, not a cloud in the sky, green trees everywhere and a light breeze off the Sound), I decided to take a long walk. My trek took me down 23rd Avenue to Montlake, where I happened upon a store that was new to me. Fuel Coffee opened up not too far from Victrola, on 19th Avenue, a few years back. That first store was a nice place, with a pretty small footprint. Well, the newer store on 23rd is a lot bigger. [There is now also a third location in Wallingford.] It has a nice big, open floor plan which is very inviting. When I stopped by, six or seven young women in business casual wear were sitting around a table laughing and drinking their coffee, while several other patrons sat scattered throughout the place. Out front was the requisite Seattle bearded guy poking at his iPhone. Barista Laura answered my several questions about the place with friendliness and aplomb. They have a very beautiful shiny black La Marzocco given pride of place right in the middle of their nice, long countertop. In general, I was impressed with the visual flow of the place, the easy-going and yet coherent feel. It's one of the hardest things to get right about a coffee shop. Couple that with good service and you've got a winning combination. Oh, the coffee, you ask? I had a pretty good cup of the house blend, drip style, that Laura served me. Fuel's coffee is roasted by longtime Seattle bean people, Caffé Vita. My cup was sweet, mellow, and fairly drinkable, with low acidity. I'm ashamed to admit that I didn't do my normal "Cappuccino, espresso, cup of drip, etc. etc. routine" because it was late in the day, I'd already had several cups at Victrola, and I hadn't even been planning on visiting Fuel at all. But it was good coffee. Now that I know I like the place, I plan on going back. If you are in that neighborhood of Seattle, I highly recommend checking it out. I'd like to invite you to a cupping of some high-quality micro-lot coffees in New York City. Recently, at the Northeast Roasters Retreat, coffee farmer and industry expert Graciano Cruz of Panama brought some fantastic, unique small-lot coffees from El Salvador. 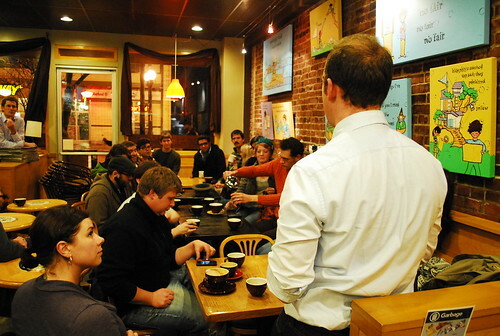 I led a cupping that went over very well with the folks who were able to make it to Vermont for the event. Since then I have been looking for a venue to get more exposure for these unique coffees. I thought you would be interested to know that Graciano Cruz is bringing more samples of those micro-lot El Salvadors we cupped, up from Central America, this time to New York City. I'm hosting a cupping at Think Coffee's Manhattan lab, on Wednesday, September 16th, at 11:30 am. I'd love for you to attend. The coffees on the table will be similar in quality to the ones we tried in Vermont, with more varied flavor profiles. Bourbons, Pacamaras, and Bourbon-Pacas blends; varied processing, too. Graciano will also be presenting some dynamite A/V material on these producers and what we can expect from them in the 2009-10 harvest. Think Coffee is at 248 Mercer Street, between 3rd and 4th Avenues 3rd and 4th Streets in downtown Manhattan. Lots of great restaurants and sights to see in that area if you want to make a day of it. Just RSVP to me at daniel@coffeescholars.com. Please also feel free to spread the word to any other quality-oriented roasters and coffee people and tell them to drop me a line if they feel like coming.